greatassistant.com – Do You Have a Great Assistant? Our Great Assistant program helps find, on-board, and train an Executive Assistant for you. Your Great Assistant will help get the bottom 80% tasks off your plate so you can get back to focusing on the big picture of your business. WHY DON’T MORE ENTREPRENEURS HAVE ASSISTANTS? What should I pay them, and how do I make them profitable? Our program helps you overcome all of these. The biggest hurdle we’ve seen with Entrepreneurs is they haven’t made the mindset shift to graduate from ‘doing the work’ to ‘leading the work’. They think it’ll be faster if they just did the 10 minute task themselves. But too often Entrepreneurs suffer from ‘death by a thousand paper-cuts’. 10 minutes here, 5 minutes there, sprinkled throughout your day and now you’ve wasted 2-4 hours bouncing back between important projects and low-level $15/hr tasks that an Assistant can easily handle. We don’t blame Entrepreneurs. Proper hiring is both complicated and time-consuming. Combing through dozens, possibly hundreds of resumes is a serious drag. Even worse than the long process of hiring one Assistant? Screwing it up and having to start all over with a new candidate. …and present you with 1-3 candidates for your consideration. Once you approve an Assistant, we proceed with doing as much on-boarding and training so you can focus on the big parts of your business. Do all exercises, attend all meetings, and we guarantee your Assistant will be a great fit for you and your company, or else we’ll find you a new Assistant. I already have recommended you guys! My VA has been a really good fit for me so far, … she’s a quality candidate and I see myself working with her for a long time. I tried 5 different times to hire an assistant over the years. Each was a terrible experience and very expensive. You guys pared me up with Bridgett in just a few weeks. You helped train us and got us working together smoothly. It has been transformational for me, my family, and my business. My VA is doing so much, so well that I actually had to let my old assistant go. The contrast was so stark I couldn’t justify keeping my old person on anymore. She is responsive, learns quickly, and is excited about the work. I feel like I really lucked out in finding Great Assistant and being matched with her. My VA is great. She is accurate in her work and helps keep me organized. I have a million more things to hand off to her, but I like the approach we are taking where she is getting a task or two a week and mastering them before I give her a new one. We’re thrilled! Our Assistant fits us so perfectly. Our Assistant has been amazing. She’s so fast! I’m getting things done I’ve been meaning to do for years. She’s really honest too. She’s getting me organized and writing SOPs. My productivity has skyrocketed. I lost 2 years of opportunity cost trying other assistants that didn’t work out. I got more traction in one week with my Great Assistant than the previous 2 years trying to find an assistant myself. If you say ‘Yes’ to two or more of the questions below, then there’s a good chance we can get you matched up with one of our trained Assistants. Are you currently working 60-80 hours/week with no end in sight? 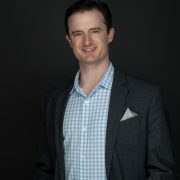 Is your business making over 6 figures in sales? Are you currently checking your own email and scheduling your own calendar? Do you see the value in someone taking over your $15/hour tasks? Have you tried to hire an Assistant in the past and failed? 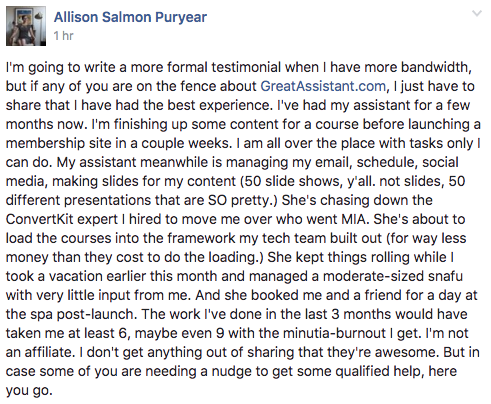 Do you have the resources to pay an Assistant $17-$20/hour? A member of our team will meet with you and gather information regarding your business and your current situation to see if our program is a fit. We will then begin the process of finding you the exact Assistant you’re looking for and present to you 1-3 candidates for you to choose from. I’m cheering you on as you travel the path of Entrepreneurship!